Seriously wide bike lane. 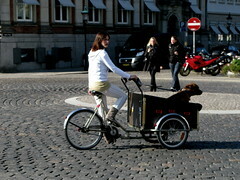 Read why it's suddenly wider on copenhagenize.com. 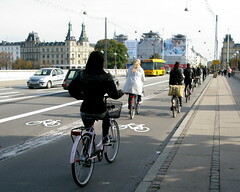 I hope as gas prices go up and bicycling becomes more popular, the US can look at Copenhagen's streets as a way that cars and bikes can travel side by side. It looks so good to be able to ride side by side on the streets without getting honked at. that's a great post! it made me smile and I haven't done that much this week. Thank you! Nice selection of photos, in a soft Autumn sun! Greetings from Edmonton, AB.